... 1991 (20 years ago today), King Norodom Sihanouk returned to Cambodia following 13 years of exile in North Korea, occasioned by Vietnam's late 1978 invasion of what was then Khmer Rouge-ruled Kampuchea. The king's arrival came soon after a U.N.-brokered peace deal. 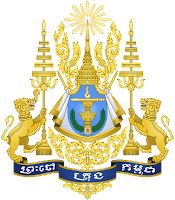 He would be restored to his throne in 1993 yet abdicate in 2004, to be succeeded by a son, King Norodom Sihamoni, who still holds that post. (credit for image of Cambodia royal coat of arms) Now 89 and suffering from a variety of ailments, Sihanouk returned once again just weeks ago, following 3 months' hospitalization in China. He vowed never again to leave his homeland. Will Schengen follow the Euro? What next for Palestine statehood?